Alfredo Aceves pitches well in a spot start, and Boston's offense strikes early and often on the way to a fourth straight win. 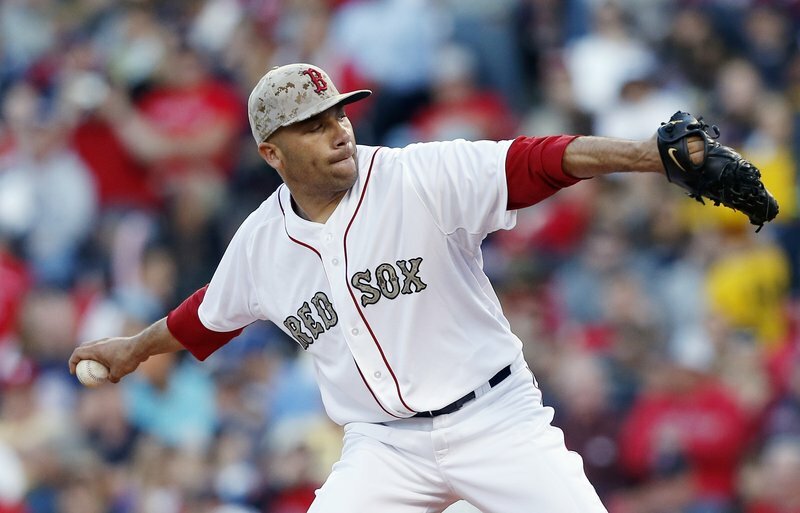 BOSTON – Alfredo Aceves only got another chance to start for the Boston Red Sox because Clay Buchholz woke up feeling soreness in his shoulder. He may have earned himself another turn in the rotation. Aceves (2-1) held the Phillies to one run over six innings in his best outing of the year, and the Boston Red Sox beat the Philadelphia Phillies 9-3 on Monday night. Dustin Pedroia and Mike Napoli homered in the first inning as Boston jumped out to an early lead off Tyler Cloyd (1-1) and coasted to victory. Jacoby Ellsbury had hits in each of the first three innings to help the Red Sox earn their fourth consecutive victory and their 10th in the last 13 games. Ellsbury also chased down Freddy Galvis’ line drive to deep center field with the bases loaded in the sixth to end the inning and protect an 8-1 lead. Aceves was sent to the minors after allowing seven runs in an April 23 start against Oakland that ballooned his ERA to 8.66. But he was sent back to the mound on Monday because Buchholz had irritation in his shoulder and collar bone from sleeping awkwardly on his side. Farrell would not say whether Aceves will get another turn in the rotation, but Buchholz is expected to miss only a few days and Franklin Morales is eligible to come off the disabled list Tuesday. Aceves, who left the ballpark without speaking to reporters, gave up seven hits and three walks while striking out four. “He looked like he was out there with a purpose,” catcher Jarrod Saltalamacchia said. Jimmy Rollins, Ryan Howard, John Mayberry and Ben Revere each had two hits for the Phillies. Erik Kratz’s solo homer in the third and Domonic Brown’s two-run shot in the eighth both curled around the Pesky Pole. Cloyd allowed three runs in the first inning and three more in the third. He lasted just 21/3 innings, giving up nine hits and a walk while striking out two. The Red Sox largely put it out of reach early, getting Pedroia’s two-run homer that also curled around the foul pole in short right field, followed one out later by Napoli’s long drive that cleared the Red Sox bullpen in right field by a dozen rows. Boston made it 6-1 in the third. David Ortiz and Napoli doubled to lead off the inning, Stephen Drew singled home another run and Ellsbury added an RBI double.